Review: "CATS ATS, a great web based ATS that you can access from anywhere that has an internet connection." We use CATS ATS on both the public sector recruiting and private sector recruiting departments. We use CATS ATS on the recruitment side for posting job orders, creating job advertisements for indeed to scrape and create pipelines. We use it in on the public and private side for Account Management to create accounts for clients, create follow-ups and track all progress with submissions. On the recruitment side, we use it for screening candidates using the sub-categories such as contacted, screening, interviewed, submitted to the salesperson, sent out to the client, offered and placed. We use it to create follows up on the recruitment side. It is used to solve tracking business issues with job orders, candidates and job ownership. 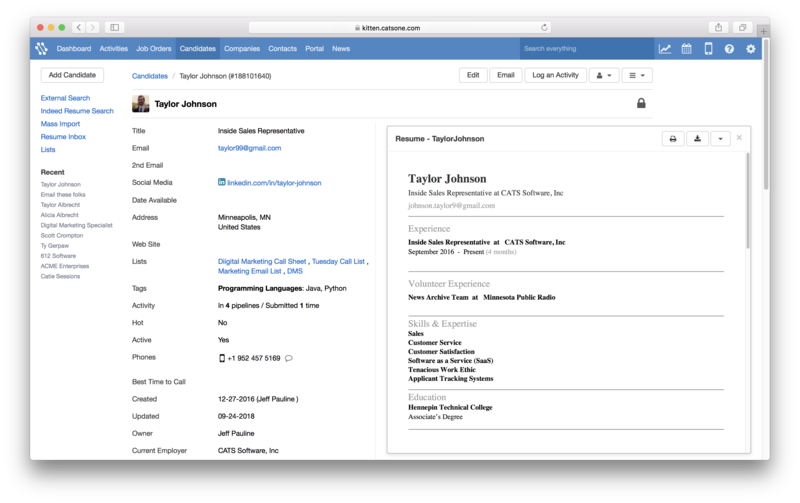 CATS ATS is a good tool for creating pipelines, tracking candidate status and connecting with talent. However, it could improve their search features. Searching candidates with specific skill sets. Example: Developer, with AngularJS and Java development experience. Also good for tracking emails sent to and received from the candidate if you have your emails configured properly. We find the add-ons very useful. Customer support is always friendly and helpful. E-mail integration and job postings save us a lot of time. When forwarding resumes if there is a position listed in subject it automatically adds them to a job order. This has caused a lot of confusion for us. E-mail integration is useful but doesn't always seem to work. Sometimes the site is slow. If you are looking for something that is not too complicated, CATS is perfect. CATS ATS Review: "Affordable, customizable, and simple to setup and use. CATS is worth a look right meow." We use CATS for all of our applicant tracking and to manage the postings for our corporate website's career page. 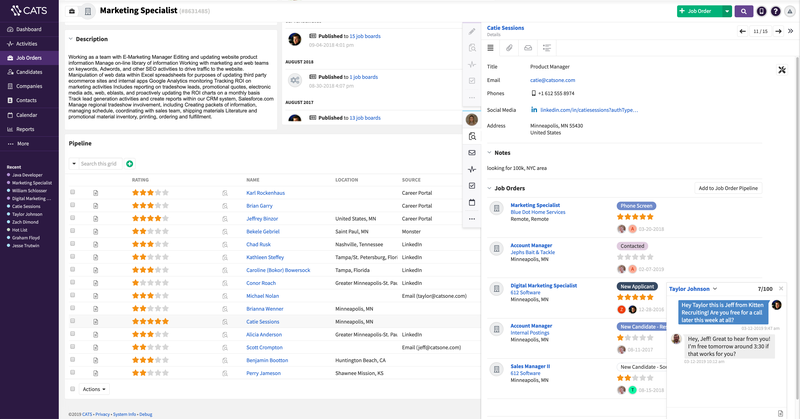 It's the only tool we use in recruiting to manage candidate information before they are hired (at which point they move to our HR system for employees) and is directly integrated to our public facing careers page. I don't know how appropriate it'd be for large organizations with very large recruiting teams - cost per license might not make sense after a certain point. For small/medium sized businesses, it's absolutely worth a look. It's very affordable, super-easy to use, highly configurable, and set up is an breeze. Knowledge base is decent, and support is generally OK, though it's not necessarily a strength. The product team is engaged with the user community to crowdsource suggestions for updates/improvements and allows users to vote on others ideas that are appealing. Search functionality is solid and documents are instantly indexed as far as I can tell - I've never noticed any delay. It'll push postings out to various free job boards and you can customize to push out to pay boards as well. It will integrate to certain HRIS packages, so if that's of interest, making sure yours is on the supported list would be important. Data backup is super easy and would likely make changing to another ATS down the road pretty simple if the need arises. CATS ATS Review: "CATS is the best ATS I have ever used"
I have been the sole user of CATS at my company since 2007, with the focus on managing the sourcing and hiring process. We hire 50+ full time per year as well as 20-30 offshore. Favorite thing about CATS - it does not disrupt how you work. It is easy to use and simply enhances what you are doing and doesn't bog you down in the technology. Love the one-click download of profiles from all sorts of sites, including LinkedIn. Mass actions are pretty common in ATS systems, but as usual CATS does it very logically and easily. I use mass actions all the time, either sending a bunch of emails, changing candidate status, etc. Reporting has improved over the years but could still be better. It is what I would call "semi-customizable" in terms of what I can generate a report on, but would like full customization capability. Mobile access is OK but not slick. Usually I don't need mobile access but every once in a while I'm out somewhere, need to grab something out of CATS and I can get it but I think there's a good opportunity to make it better. For any recruiting agency or small to mid-sized firm looking for a good, economical, easy to use ATS then CATS is the best. If you need a complete HRIS system, talent management, payroll, etc., then there may be better options for you. CATS ATS Review: "CatsOne worth a look..."
I have been using CATS for several years. I was able to obtain my return of investment within 2 months. I would highly recommend a demo. Its ease to implement and ease of use is a benefit for the company that I started. It is well suited for data mining and delivery. It is less suited for large organizations where they need an ATS and the payroll system to be connected. CATS ATS Review: "Great Pipeline Management System"
We use CATS within the Search Group division of ResourceMFG. It is used to manage the pipelines of highly skilled searches we are engaging with across the country with many different skilled recruiters utilizing the system. CATS Applicant Tracking System is ideal for companies with smaller internal recruiting teams. CATS ATS Review: "Great ATS"
We are a staffing agency so we use it for our central piece of business software and thus we use it for applicant tracking as well as managing all of our job orders. In addition to this we use it as our customer relationship management tool with all of our clients and client contacts. Very easy to use from a work flow perspective in adding candidates linking them to jobs and following them through the process. Great plugin for browsers, Outlook and Word to easily import resumes and candidate profiles. They are regularly updating the systems so you get ongoing improvements. The CRM capability for business development is just OK.
From a pure ATS standpoint it is very strong. Depending on CRM requirements from a business development standpoint it is something to evaluate closely. Overall for us it is a great system that I would highly recommend given its functionality and price point in the marketplace. CATS ATS: "CATS is an excellent tool for Corporate and Agency Recruiters"
We are using CATS across the entire organization to manage the entire recruitment life cycle from job posting through hire. CATS has helped us solve many organizational challenges, including finding talent quickly, saving time by automatically posting our jobs to external job boards, and creating a branded career website to be embedded in our company site. Provide its users with robust features that even surpasses many of the largest, most expensive recruitment solutions. Provide a solutions that is highly customizable without having to purchase pricey add-ons. In fact, non-technical users are able to easily customize the solution. It is extremely user friendly and is scalable to meet the needs of growing and shrinking organizations. There is opportunity to continue to increase partnerships; especially with tools like TalentHook, and various resume databases. It is well suited for both Corporate and Agency recruiters and organizations of varying sizes seeking a robust recruitment solution capable of increasing and managing candidate pipelines for current requisitions and strategic pipeline development for future roles. CATS ATS Review: "Affordable, Intuitive, Flawed." CATS is our company's applicant tracking system. All applicants, regardless of which division they are applying for, go through the CATS interface. It starts with the careers portal on our website, takes the applicants through the application, collects their information needed for compliance, and allows the recruiters to move the applicant through the hiring process. It's intuitive. You don't need an instruction manual or extensive training from an implementation team. There are weekly webinars and YouTube videos in case you need additional guidance on how to do something. It has many of the bells and whistles of other, more expensive ATS's. I've had several disappointing interactions with the product support team. Don't expect much from customer service. It's unlikely you will pass an AAP/EEO audit with their limited reporting capability. CATS has two products - HR and agency. So no matter what kind of recruiting you do, it will work for you. If there's a chance you may be audited by the Department of Labor, you should consider another product with a more detailed reporting capability. CATS ATS Review: "wonderful experience in sharing my feedback"
We used CATS Applicant Tracking System for our entire organization starting from resume submission, to the interview process, paperwork and onboarding. It was easy to track the particular applicant. It was was easy to use it for performance appraisals. It was easy to manage onboarding candidates. Vendor could give us mass mailing tool. Price should have been little less. Depends on client specific feedback on requirements. We used it to analyse candidates very well before we uploaded them in CATS Applicant Tracking System. CATS ATS Review: "Super easy to use and implement"
CATS is simple and easy to use. Basically it's an "out of the box" solution that is user friendly and has a great interface. You are able to accept applications and forms for the applicants within the online interface. The ability to post job openings on free job board sites is an incentive for anyone using the software. The software being cloud based means that I can access this from anywhere I want. Search feature is limited and needs improvement. The way to go in the digital industry is cloud based platforms. If you're not cloud based yet, keep an open mind and try this. CATS ATS Review: "Very Fast & Efficient ATS That Improves Our Bottom Line"
Allows for customization of work flow and processes. Simple, easy to use interface, means less training and directing users where to go or what to do to accomplish a task. Very streamlined and clean. No clunkiness. Allow for company branding (user facing). More syndication avenues for jobs. Cast a wider net. Works very well for high volume, life cycle recruiting. CATS ATS Review: "CATS... It works!" CATS is used across my organization and is used to keep track of all candidates that we speak with. CATS is mobile enabled and lets me get candidate information when I'm on the go. CATS also has a very strong support department. Anytime that we've had a problem a real live person has been able to help us resolve the problem and has done so quickly. CATS is very intuitive and allows me to manage my candidates quickly. The safeguard to protect your database from duplicates is absolute trash. It catches duplicates less than half of the time. I think CATS is best for a small team. A large team using CATS would have too many problems with duplicates. CATS ATS Review: "Its good, but could be better with more reporting features"
It is the ATS system used by the recruiting department. There is just one report, a job order report, which can have "quick notes, job location, recruiter name, etc. added to the reports. But we need basic reports on individual recruiter productivity, and CATS doesn't offer any. Its weird because we enter the data, but there's just no quick reports to pull the information we've entered and print a simple report on a recruiter's monthly/quarterly/yearly productivity such as placements, interviews, submittals, etc. If you need recruiter productivity reports, you'll need a different ATS. But as a basic and inexpensive ATS, CATS is great. CATS ATS Review: "CATS is for YOU"
CATS Applicant Tracking System is being used at our company to keep our potential candidates organized to easily find and review each individual when necessary. It keeps our cross referencing between BU units very simple, eliminating our servers from an overload of files. Allows you to keep lists of companies or individuals. Stores thousands of databases, lists, candidates and job orders. Quick and thorough responses from Support and eager to help. I would like for old lists to be accessible, I'm unable to see all lists. When uploading names, not all duplicates are found, therefore, CATS can improve on eliminating duplication. CATS Applicant Tracking System is VERY well suited for an executive search company and helps with cross referencing candidates. CATS ATS Review: "CATS has figured out how to best assist us in the executive search business!" We are a small (1 person) recruiting firm that specializes in the Renewable Energy Industry. CATS is used to track, recruit and develop candidates in addition to client communications, job order tracking and marketing. I haven't had any issues or problems. They are constantly listening to their customers and creating new updates and improvements. I've only used the CATS product in a small recruiting firm environment and it works perfectly. I used to manage a National Search firm and I see the product as very adaptable on a large scale as well. CATS ATS Review: "Great ATS Solution for Small Company with Many Jobs!" CATS is being used by our entire recruiting staff (both office workers and remote employees) and it allows us to keep our candidates, clients, and job orders organized. It allows us to collaborate no matter where we are and to always know where our candidates are in the hiring process/pipeline. Being able to customize fields, workflows, and the job portal is the absolute best part of CATS! I think it's well suited for any size business - it's especially good if you have multiple job openings to fill. CATS ATS Review: "Advanced System, Simple Use"
We manage the internal recruiting/hiring process for specific clients locally and nationwide. CATs helps us find and track the best candidates for the position and run reports regularly to track candidate flow/information. When the developers change an aspect to the system, they should double check on little glitches on the clients end. I have had a few instances where things were not displaying properly but as soon as I call technical support they fix the problem. 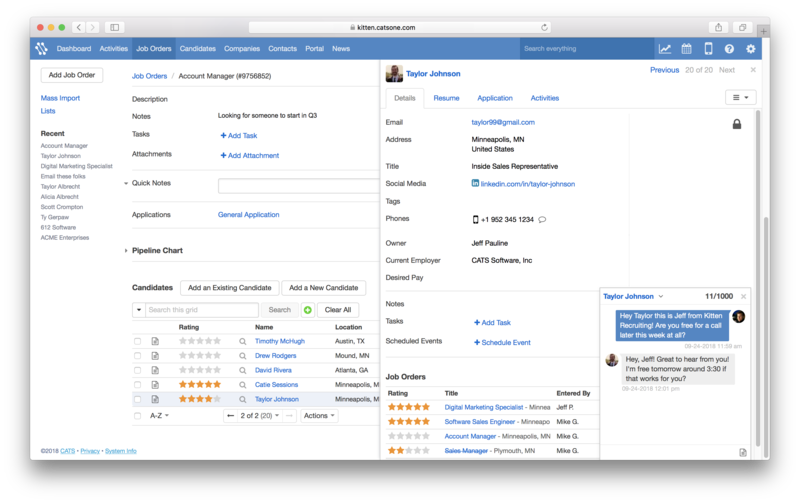 This is a great system to keep track of multiple jobs with different processes in the hiring process. The depth of details that you can arrange even a question is perfect for having multiple places with specific needs. CATS ATS Review: "Wonderful Product for Applicants and Employee Forms"
We have been using this product since the end of 2013 and have been able to successfully accept applications online and receive employee forms online once they have been hired. It is being used for the entire organization which has many campgrounds and visitors centers over four states. It is both easy to use and understand. It eliminates the need to have thousands of pieces of paper. It is well suited for an organization which has multiple job postings. CATS ATS Review: "CatsOne - KISS!" More companies to utilize CatsOne. I recommend it to all of my colleagues. CATS ATS Review: "Kick Started my recruiting business!" We grew the business from self managed applicant tracking to selecting CATS as our solution. We investigated many solutions and settled on CATS. We are happy with that decision and it is used as our primary tool. We use it internally as well as for interfacing with our clients. It is also used for complete candidate lifecycle tracking for my recruiting firm. Excellent trigger email solutions. Customizable and easy to configure. High-End presence and able to customize for specific client's needs. Client doesn't need to fit our flow, we customize for them with CATS flexibility. More International free job site integrations. CATS ATS Review: "East to use ATS"
CATS is being used by the entire organization to track all open requisitions and candidates. Prior to CATS there was no ATS in place. Now we have a database of over 10000 resumes. We also link our website to INDEED so that all of our current openings are advertised. We receive a high number of resumes directly into CATS from INDEED postings. Easy tracking of candidates against requisitions. Reporting function is lacking. Few canned reports that are of any value. CATS should improve the ability to generate ad hoc reports. CATS is ideal as a 'beginners' ATS. It is good for a smaller organization that does not have a lot of money. CATS ATS Review: "Full features, highly customizable and great value"
I am a sole proprietor third party recruiter and use CATS ATS exclusively for the full process recruiting. CATS is very flexible with many options for customization. As such, I have been able to adapt it very specifically to my own business processes and also adapt it as my processes adapt to market conditions or my improvements in process. 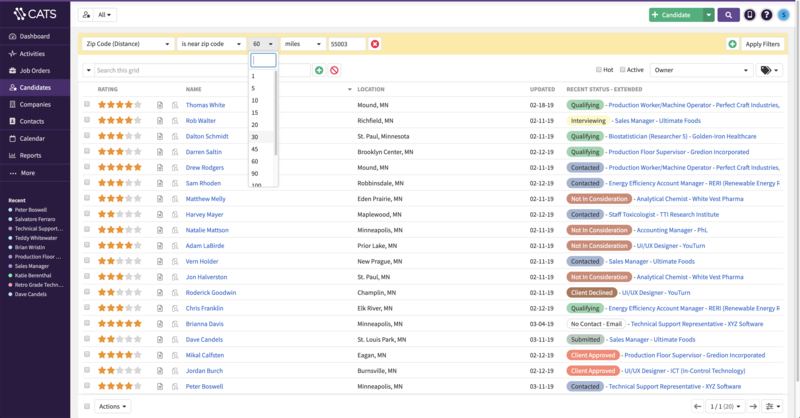 It has exponentially improved my ability to track contact, pipeline workflow, sourcing etc. I also have a lot of split partners and the customization has allowed me to optimize that process, as well. Being cloud-based (my previous software was not) I can access it outside of the office and normal business hours which is most helpful as, given the nature of my business, many conversations and interactions necessarily take place outside the normal workday / workplace. Custom fields for all entities of any data type let's you track what you care about. Also customizable workflow with triggers can save a ton of time in automating processes and also ensuring steps aren't missed/established processes and protocols are adhered to. Support is extremely responsive, knowledgeable and committed to resolving any issue. Integrations with LinkedIn, job boards etc. is a big time saver and helps bring it all to one place. I would like to see either an integration with a robust reporting tool that would allow me to design my own custom reports with a data export or more built-in reporting options. Mobile app is currently mostly just a look-up tool. I would like it to have the ability to do more - add tasks, update pipelines, etc. I am a sole proprietor doing third party recruiting. For me, it is the perfect solution set without being overkill (for which I would pay with other products). I can't really speak to any scenario other than that. In evaluating it, I HIGHLY recommend playing around with the online demo to see for yourself how you would adapt it to your needs. However, also do not be afraid to ask how to accomplish certain things. There is a LOT of functionality that is not immediately obvious but which support can quickly get you to. CATS ATS Review: "Decent system, but has its weaknesses"
We are using CATS to track our candidate applicants, our recruiting efforts, as well as our hired employees. The system streamlines the hiring/approval process by automatically generating emails and tasks for the necessary persons involved. Customer Service is quite prompt and responsive. CATS may be inadequate for all of our needs, but they are making major improvements. The system's user interface is clumsy and not organized very well. CATS is difficult to use as a federal contractor, as it does not easily generate the data that we need to provide to meet regulations. We have managed work-arounds by using fields for uses they were not designed, but we are still unable to accurately and automatically generate the data we need. CATS ATS Review: "Easy to Use"
CATS is being used in the HR department to help us streamline the applicant tracking, job posting, applicant review and applicant contact processes. It is a small HR department and prior to implementing in 2009 our processes were entirely manual. CATS has allowed us to save many labor hours in these processes and has improved the candidate experience. The location of some of the features is not intuitive (you have to hunt around for it). Ensure that you evaluate your needs first and then determine if the various elements of the software match. 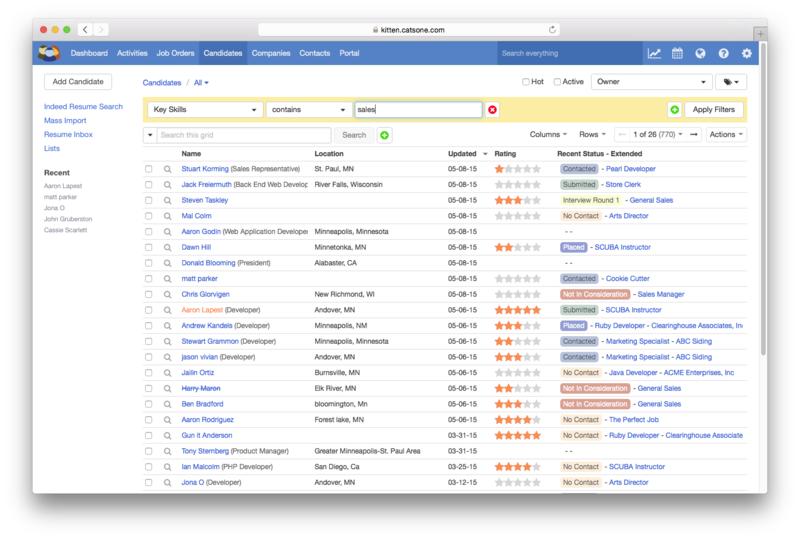 CATS is a full-featured, web-based recruiting software that is designed to make it easy to track and hire talent. 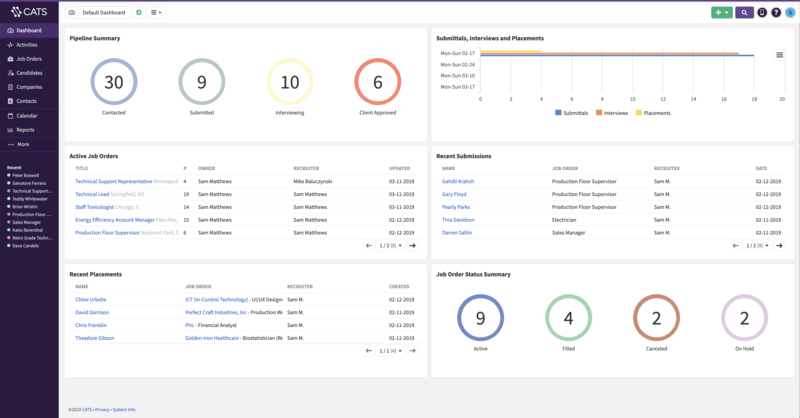 Accessible from any browser or mobile device, users can manage the entire recruiting process from creating custom job applications to posting jobs to leading job sites to generating customized reports. 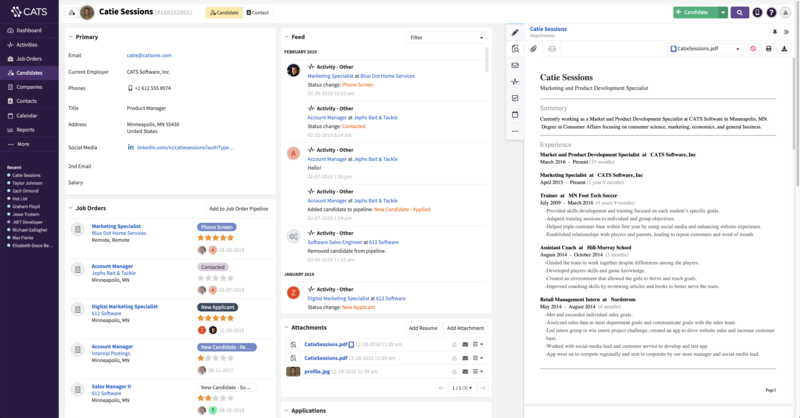 Users can also create highly customizable hosted career portals, keyword search inside resumes, source candidates using the CATS browser extension, and design custom workflows to match their recruiting process. ActivitiesEasily view candidates, without leaving the job order, using the candidate preview. Even quickly communicate with candidate via SMS without leaving your current screen.Quickly view resumes (or other attachments) with split-view.Easily view candidates, without leaving the job order, using the candidate preview. Even quickly communicate with candidate via SMS without leaving your current screen.Candidate ProfileAdd filters to quickly search and narrow down your candidate database.